DCPL is largest manufacturer and exporter of all type of oxygen gas plant for medical & industrial use. We are a well established company in India and are popular for designing and manufacturing Oxygen Gas Plant. The machines of our company are popular all over the world for being technologically very advanced and high performing. The systems generate oxygen and nitrogen with purity upto 99.7% and 99.99% respectively and come in with capacity ranging from 20 m3/hr to 5000 m3/hr. We are trusted for offering premium quality Oxygen gas manufacturer plant that is manufactured using the latest cryogenic distillation technology. Customers prefer our oxygen production plants because of their various useful features. We have established our reputation on the strength of our commitment to high standards and superb customer service. We always endeavor to meet the expectations of our customers. Our company is focused on providing high quality oxygen gas manufacturer plant that comes in various capacities and sizes ranging from 20m3/hour to 1000m3/hour. Constructed with premium quality air compressors, our oxygen gas manufacturer plant will deliver balanced performance between 6 and 8 bars. And, our oxygen gas plant is manufactured in accordance with the highest safety, health and environmental standards. DCPL offers industrial oxygen generation systems such as oxygen gas plant for application in various industries. Our oxygen gas producing plant is manufactured and fabricated with technology imported from an acclaimed Italian company. Cutting-edge technology is used in the manufacturing and fabricating of the oxygen gas making plant and is at par with the best in the world. The superior technology helps our plant machinery to deliver high class performance. Our oxygen production plant is fully automated and is characterized by low power consumption, low maintenance cost and generate high purity oxygen. Our oxygen gas plant are fabricated in different sizes ranging from 20m3/hour to 500m3/hour. High quality raw material is used in the fabricating and manufacturing of oxygen gas plants. Our company is famous for making oxygen gas plant because of our superior technology and world-class designing. On the other hand, oxygen gas making plant is trusted by customers from all over the world for reliability, durability and useful features. Quality of our oxygen producing plants is thoroughly checked by our in-house quality analysts as they put all machinery to rigorous testing before it is Okayed for sale to the customers. In recognition of our strict quality control measures, we have been awarded ISO 9001:2008 and CE certifications. Customers opt for oxygen gas plants because they are constructed in compliance with EIGA (European Industrial Gas Association) standards. 100% cryogenic grade stainless steel is used in the fabricating of air separation units. Materials employed in the making of the oxygen gas plant are as per American Society for Mechanical Engineers (ASME). DCPL is renowned for manufacturing and fabricating top-class oxygen gas producing plants that are distinguished by their valuable features like low power consumption, single electric panel, round the clock operations and numerous other features. Our company manufactures cylinder filling oxygen gas plant using latest cutting-edge technology in the manufacturing of liquid oxygen plants. Our technology is imported from an acclaimed Italian company that supplies oxygen plants, oxygen gas manufacturing plants and oxygen generating plants all over the globe. Advanced quality raw materials are used in the fabricating of our oxygen cylinder filling plants. We have become the preferred choice of customers from around the world because of our commitment to quality and use of superior technology. Our manufacturing is carried out in compliance with international standards. For complying with quality control standards, we have been awarded ISO 9001:2008 and CE certifications. It is necessary for including Afghanistan, Yemen, Syria, UAE, Saudi Arabia, Nigeria, Egypt, Ghana, Morocco, Oman, Qatar, Iraq, Colombia, Mexico, etc. DCPL is a reputed Oxygen plant manufacturer in India that supplies oxygen gas making plant manufactured using the best quality raw materials. Technology used in the fabricating of the machinery is imported from the best industrial gas plant manufacturing companies in Europe. With superior technology, resources, quality standards, our company is able to fabricate and manufacture cylinder filling oxygen plants that satisfies the expectations of our clients. Our oxygen production plants generate oxygen via the process of compression, cooling, liquefaction and distillation of air. Our company is reputed for supplying oxygen gas plants with SGS quality approval, ISO 9001:2008 and CE certifications. Our company fabricates oxygen gas making plant in different capacities ranging from 20m3/hour to 500m3/hour. Being a company satisfying customers, we are always innovating to make our oxygen production plants efficient, reliable, high performing and durable. We also offer excellent after sales service, installation and warranty/ guarantee services. Our plant machinery is fully automated and distinguished for low power consumption and low maintenance cost. Made with cryogenic grade stainless steel, our oxygen gas making plant can deliver oxygen with purity up to 99.7%. Our oxygen plant machinery is designed and manufactured by our experienced engineers and exported throughout the globe. 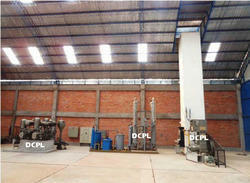 DCPL is a reputed manufacturer and supplier of Cylinder filling oxygen gas plants. We manufacture oxygen production plants employing the superior technology. Our oxygen generating plants are fully automated and have host of other features. With capacities ranging from 20m3/hour to 500m3/hour, the output purity of oxygen generated in oxygen gas making plant is 99.7%. Our plant machinery is manufactured in compliance with international quality control processes. On purchasing from us, the customers will get oxygen production plants that are easy to operate and meet the standards of North American and European Pharmacopeia. As our company use proven advanced technology, it goes without saying that our cylinder filling gas plant is characterized by its reliability, performance and durability. Focused as we are on satisfaction of customers, we endeavor to deliver plant machinery that is at par with the best in the world. Customers from around the globe prefer to buy our oxygen production plants because of the proven quality and performance of our machines. Moreover, we also provide responsive customer service and after sales service. Besides, we are awarded ISO 9001:2008 and CE certifications.